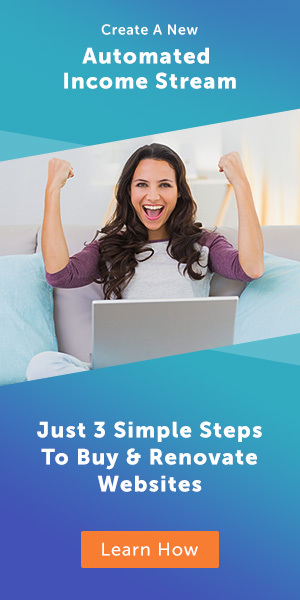 Today I’m having a look around on Flippa for some low entry-point websites which are a great way to get started, as well as some recent website sales of over $30,000 to see the kind of returns that are available in the current market. Click on the YouTube video below to watch me do this live. 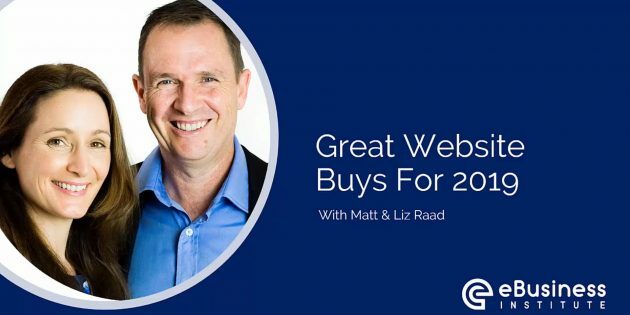 Hi, it’s Liz Raad and today what we’re going to do is go through some great website buys for 2019. So we’re going to have a look at some of the websites that are listed in the marketplace right now. Some that have just recently sold, so that we can see the trends that are happening, the niches and perhaps the prices that are coming out in the marketplace right now, and also some hints and tips and tricks for finding great websites to buy right now from 2019. So let’s head over, straight over to Flippa and have a look what’s available. So first of all, you might recall that one of our top pieces of advice and one of the best things about this market place is you can start at a very low level, like a low investment. Which is fantastic because we can practice on those smaller sites and as we get bigger it’s just a matter of adding zeros. So let’s have a look on the marketplace what’s out there in that lower end range that you can get for under 500 dollars because that’s where we recommend you start. Check out this one, OutdoorRealityShows.com. So obviously a website about outdoor reality shows. Obviously gives a lot of good content about these shows, maybe who’s on them and what the results are. You can see it’s two to three years old there. It makes it’s money from AdSense which is a model we love because it’s very very leveraged. So when someone clicks on an ad on that website, you make money if you own the website. Now it doesn’t make a lot. You can see there down the bottom, 10 a month. But it’s currently priced at 75 dollars. The green of that big price means it’s on the market so it will sell and it was a reserve at a dollar so it could sell for anything 75 dollars or up. So what a cool bargain, something might be worth having a look at. Another one we’ve got here, City Runners Club. A lot of the time people grab domain names that have some age to them and then rebuild websites on them. So they’ve got a lot of history in Google and that’s worth something. So this one again, it’s five years old. It’s only making four dollars a month but currently the bids at 60 dollars. So that would be a really nice first site. It’s a nice targeted niche about city running clubs and we could always build something out there and either monetize it perhaps with some Amazon products. Perhaps with runners or your AdSense, Google advertising program. Another one, BestFamousToys.com. So this is properly more like a review site. One that lists different toys and talks about them and remember you don’t have to know about toys in order to own a toy site. You can get people to write the content for you. And you can see there he’s asking for anywhere from 93 dollars for that and you could buy it now for 500 dollars. So that’s not a particularly aged website, it’s only seven months old but it gets you in the game and it gets you buying a website and owning a very good domain name there too, BestFamousToys.com. This one I love because this is one of those really nice niched topics that can make a lot of money because Easy Shredder Mart. So this is obviously a website that’s about shredders and reviewing the best paper shredders. We actually knew an offline business that made a lot of money out of shredders and there you go, you can buy that one. It’s only a year old and only a minimal net profit at this point but it’s 500 dollars or buy it now for 850. So that can get you in the game, get you a website, all done all built already with some history to it and possibly even making some money. So we’d need to, remember that we’re not doing, I haven’t done due diligence on these but it’s really great to have a look at in the market place at the sort of websites that are there for you and that you can get into the marketplace really nice and quickly, easily, and pretty cheap. Now I want to have a look at some of the websites that have sold recently, because this is exciting. What this tells me, so this is one called Convert PDF to Word. So that’s basically a website that you put in a PDF document and it will convert it to a Word document which is very very handy. It’s aged so it’s seven years old. Now this ones a little more complex, it’s not a word pressed because it has some programing to do what it needs to do. But you can see there it makes 1100 or 1200 dollars a month. Mostly out of ads, AdSense, the Google AdSense program which is nice automated income. And you can see there it sold for over 39 thousand dollars. Now the multiple of that, let’s see 39 thousand divided by 1200. Just doing the maths there, is just over 30 times multiple. So what we’re seeing now in the marketplace is that good websites are selling for 20 to 30 times which means if you can buy a website and renovate you’ve got some really good value sitting there for yourself or you might just want to keep that net profit, that 1200 a month. This is an interesting one as well. Now it doesn’t show the actual URL of the website. But this is a four year old website. It’s monetized with Amazon which means it makes money out of selling and affiliate product so people just click through to Amazon and make money and that the owner of the website makes money if someone buys something. It’s in the automotive niche which is a really good niche. We’ve had sites in the automotive niche and there’s a lot of money to be made. You can see there it’s got a lot of unique visitors, over 11 thousand. And it’s very nice steady traffic so that makes it’s a very nice buy and you can see there again it’s gone for 28 times. Net profit of about 1000 dollars a month and sold for 28 thousand dollars. Now that may seem a lot but when you think about it, if you had 28 thousand dollars in the bank it would certainly not be returning you 1000 dollars a month. And with some renovations, what our goal in any website we buy is to double that net profit. So that would be our goal if we bought that website. This another interesting one too. I’m not even going to try and pronounce that because it’s in Spanish. But don’t be afraid of checking out these kind of websites even though they’re in another language. You can get other people, of course you’re not creating the content yourself you’re getting other people to create the content and here’s one that’s making 680 dollars a month and it was sold for four and a half thousand. So that’s less than 10 times. So I just wanted to flag that they’re not all selling, you can still find bargains and especially when you have something like this that’s a little bit different, that a lot of some people aren’t willing to take on because it’s in a different language. If you’ve got the advantage of knowing that language or you’re not afraid to take on, it will be a little bit more challenging perhaps, but we’ve got Spanish websites. I love them. And that’s a really nice multiple. So that I’d be looking at doubling that and then taking really nice profits. Now here’s one that, this is the sort of thing I love. BestMattressReviews.com, because it basically what it does is provide content about what are the best mattresses. That’s a really good niche because think about it, when you go and buy a mattress it’s really quite a big process to figure out which mattress you’re going to buy and what the benefits of certain mattresses are. Should you be getting a memory foam? Should you be getting a pillow top one? Should you be getting hard or soft? Or all that sort of stuff. So BestMattressReviews.com, four thousand unique visitors a month there. You can see the traffic’s dropping which is interesting so I would be looking at that in my due diligence just to make sure we can bring that traffic back up again. But quite often that’s not a difficult thing, it’s about getting just some simple things in place on the website so that it ranks well in the search engines. So what a cool website. And the final thing I wanted to show you was this particular website and there’s lots of these on Flippa. If you go there and have a look at the e-commerce section on Flippa. I wanted you to just be thinking outside the square because if you are thinking of starting an Amazon FBA of affined by Amazon store or you’re going to do something on Amazon, always have a look on Flippa as well. So what you’re learning, if you learn how to buy a websites, what you can do is basically shortcut all the testing and all the set up and all the getting of the suppliers and all that stuff, you can buy a system that’s already working. You can see that’s two years old and it’s based in the UK, Germany, France, Italy and Spain, which is interesting. So that’s a really nice different niche with a 30 thousand, over 30 thousand dollars in profit per year. So about two and half thousand dollars a month. Now that’s on live at the moment, so I’m going to be following that and I’ll be interested to see how much that goes for, there’s only seven days left so we’ll see how that goes. But that is a bargain way to get into the marketplace if you are looking at doing e-commerce. You basically bypass all the start-up phase and go into a business that is already up and running and proven itself and working. So what a great market wrap-up. Main thing is get out there and have a look on Flippa. There’s some awesome bargains out there and there are also some really great buys going forward for 2019. We’re really excited about this year – the market’s still growing, it’s a great time to be in and we’ll look forward to seeing you in there too!